It's been about a month or so since my last post here in the CDX and a lot has gone on. Sad to say I'm yet to finish my latest model, however, I have been able to expand on another collection of mine that's taken its merry time to be put together. In other words, I'm talking Transformers; G1 that is, toy gold, matrix tea. 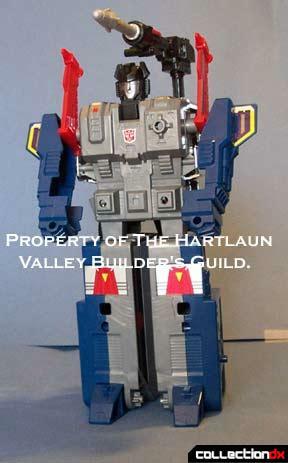 Anyway, what I bring you today is something I've \hunted for since yesteryear; the Powermaster Optimus Prime. As most of you know, this beast of a bot was very elusive back in the days of its release. It came to us in the form of the great leader in both the Marvel Comics series and the Trans-anime series "Masterforce"(where it also had another added component to its mighty girth). The figure I bring you, however, isn't a Japanese/Takara reissue, but rather the domestic version by Hasbro as part of the Commemorative Editions (series 2). Truth is there's no big difference, but a lot has changed since this big bot since it last graced the US toy stores. 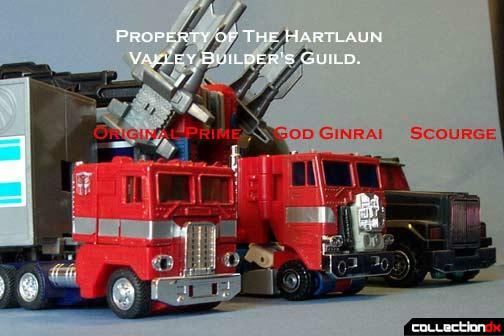 The PM Prime consists of four major parts; Prime, his trailer, the Godbomber (Apex Armor), and the engine/powermaster figure 'Ginrai' (HiQ). 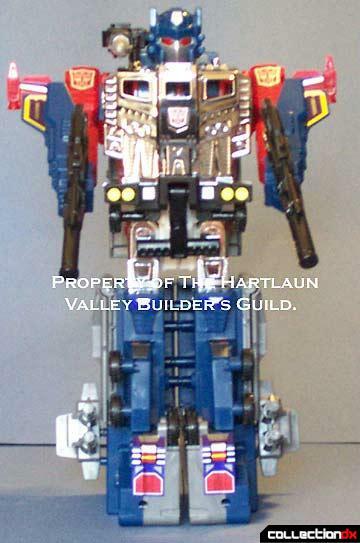 Ginrai connects to Prime to enable him to transform (cheap cheat; press in the white tab on the engine block and you don't have to have Ginrai attached at all). 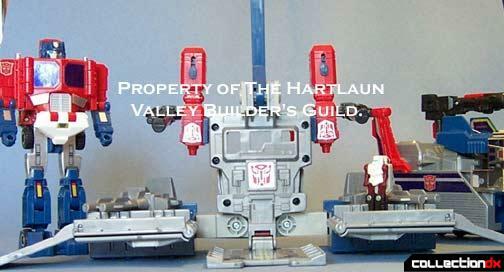 The trailer transforms into a Metroplex like base and into the body for Super Ginrai (otherwise known as Super Prime). The Apex armor is that pre mentioned add on part from the Masterforce series which consists of a psuedo-lego block assembled robot that becomes extra armor for Super Ginrai to create God Ginrai or its formed into one solid block that you fit between the trailer's 'ankles' to have it follow behind in vehicle mode. All in all, a good amount of stuff for the $50 price tag. From the present to the past perspective, we see where they came up with all that 'Super Optimus Prime' stuff seen in RiD and Armada. RiD perspective: God Bomber was the basis for Ultra Magnus when creating the God Ginrai from an already powered up Optimus, resulting in literally a tower of power. Armada: simply take prime's body, converting him into truck mode and attaching it as the torso and head assembly for Super Optimus Prime. Only differences here are that the trailer doesn't transform on its own, nor are the arms a part of the Optimus truck, instead, they're in the trailer. 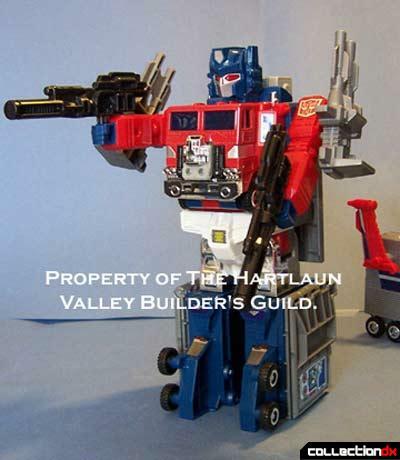 Also, once you've finished attaching all of the other parts to this guy you can't help but sing "fat guy in a little coat"
I never had the original Prime that came out back in the day, but I did have a friend that showed it to me a long time ago, but this is what I've noticed in changes. One of the changes since its original debut would be some of the coloration. For instance (the truck) Prime's eyes were red, now they're blue. His legs were solid blue with a silver sticker for the front of the thighs; now they are silver painted in the thighs with the same sticker added anyway. I'm not sure about this one though but the windows on the front of the cab are clear blue plastic while the front of the cab itself is molded in die cast. The Super Ginrai (Super Prime) body has had some color tweaking as well; the legs have been chromed and the hands that were once red are now blue and with an improved slide switch. Also, the bulk of the once light gray areas on the body have now been 'silverized' so that all gray areas like this match the same color of the original Prime's trailer. In short; Super Prime now is colored to match the smaller bot. Another color change is rather minute, but it's not hard to miss. On the Ginrai/HiQ figure you'll notice that what was once the same color red as the bulk of Prime's body is now more of a maroon color, also you'll see some parts of the same color in some slightly visible regions across the overall bot. The next changes are a fan peeve set by the politicians; obscured long missiles and shorter smokestacks. I tried firing the missile from the newly added cannon (part of the God Bomber) and to say the least they fire but not as far as the old ones would have. The smokestacks again were cut down and are no longer than those on the previous CE released Optimus Prime and Ultra Magnus. Last but not least is something I've already mentioned; the God Bomber trailer. If anybody who's gotten the original PM Prime will know, this wasn't in the package because there was no need for it. Not only that but I don't think this bot existed at the time (I know I might be wrong) which is why when Takara reissued it, they packaged it along for the ride. Hence the one in stores now is a carryover from the Japanese counterpart. Since this Prime has been out for a long time I feel I don't need to go into the basics as I do my model kit reviews. Overall when you say "Optimus Prime"the toys speak for themselves. Tack on "Powermaster" and it's a nuff said situation. Anyway, for sake of this review, I feel that this is one of the better CE releases. For one thing its got the original box art, not some poorly done scan job of any Dreamwave poster or a Pat Lee mockup (no bash on the man, he's a great artist). Instead, the package is nicely done in old school Autobot red with a folding Velcro plate of the God Ginrai on it that you can peel away to show more parts. Box aside the bots inside are very solid and the quality of reconstruction is above par. As I said before, I've waited a long time for this Prime and am not disappointed by anything about it. 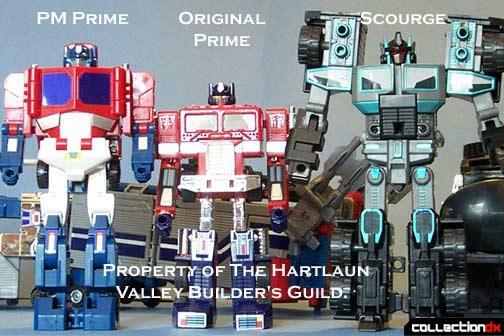 Therefore on the Buildometer scale, I give the Powermaster Optimus Prime a perfect 10.
" In a word.. Prime." 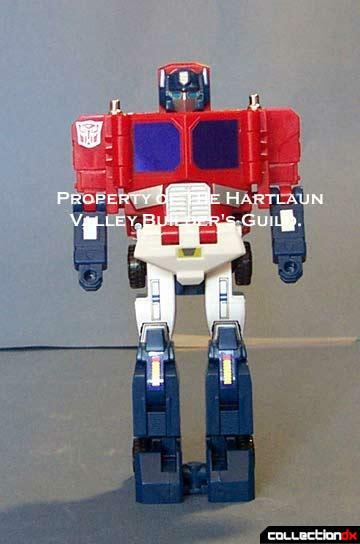 I've got 3 Powermaster Optimus Prime with Apex Armour reissues at the moment but I'm keeping my eyes and ears open for another 2 Powermaster Optimus Prime with Apex Armour reissues during 2013 or on my 29th birthday on July 24th 2013.